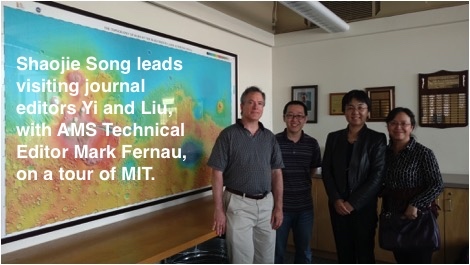 In October 2015 an AMS delegation that included a number of AMS Publications staff and AMS Publications Commissioner Bob Rauber took part in a symposium in Tianjin, China, on “The Latest Developments in Atmospheric Science and Meteorological Journals,” hosted by staff from the journals publishing program of the Chinese Meteorological Society (CMS). The symposium was an opportunity for AMS and CMS staff to share information on their respective programs, and to share ideas on the common challenges we face: attracting good manuscripts, supporting volunteer editors and reviewers, maintaining rigorous standards for peer review while making that process as efficient as possible, improving the production time to allow accepted papers to appear quickly, and keeping expenses as low as possible to allow a sustainable business model. There was agreement that such exchanges were extremely useful and should continue. Despite their myriad other duties (the symposium took place during the CMS Annual Meeting), our hosts took marvelous care of the AMS delegation, including making sure we got to The Great Wall, had endless amounts of good food, and had a tour of the CMS campus in Beijing. The AMS delegation left China looking forward to a chance to return the favor, and during the week of May 23 we had the pleasure of hosting two guests from CMS who attended the annual meeting of the AMS Publications Commission in Boston: Dr. Lan Yi, executive chief editor of CMS’s Journal of Meteorological Research, and Ms. Aidi Liu, executive chief editor of the Chinese Journal of Atmospheric Sciences (published by the Institute of Atmospheric Physics, Chinese Academy of Sciences). 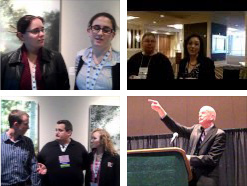 While the week’s activities did not quite reach the fever pitch of either society’s Annual Meeting, it was full enough. In addition to sitting in on the Publications Commission presentations and deliberations, Dr. Yi and Ms. Liu had in-depth meetings with AMS journals and BAMS staff on topics ranging from business models to technologies management to the strategies the various teams within AMS Publications use to manage productivity, priorities, and resources. 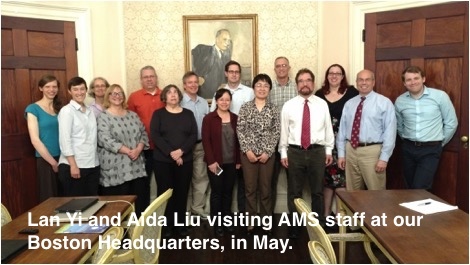 AMS Librarian Jinny Nathans gave an overview of AMS’s involvement in ASLI (Atmospheric Science Librarians International) and gave a tour of AMS headquarters at historic 45 Beacon Street. She also described the project to digitize the entire run of BAMS (back to 1920) in commemoration of the AMS’s Centennial in 2020. While the formal meetings ended with lunch on Friday, the conversations continued during a boat tour of Boston Harbor.